Black Scrim. Power Amplifiers. Power Cables. Product Cases. STAND NOT INCLUDED. Stand Accessories. Active Speakers. Other Stands. White Scrim. Power Amplifiers. Power Cables. Product Cases. STAND NOT INCLUDED. Stand Accessories. Other Stands. Microphone Stands. The ADJ Aluminum I-Beam truss for the Pro Event Table and Pro Event Table II allow you to hang lighting fixtures such as light weight par cans, wash fixtures, effect lights or small moving heads. Power Amplifiers. Black lycra scrim for the ADJ Pro Event Table, Pro Event Table II and the Equinox Truss Booth. It’s designed to hide cables and provide a clean, professional look. Details The Pro Event Table Scrim (PRO-ETS) is an accessory for the ADJ Pro Event Table & Pro Event Table II. It provides a clean look by hiding cables. Fits ADJ Pro Event Table. Rack Cases. Power Amplifiers. Power Cables. Corner Shelf. Product Cases. Stand Accessories. Other Stands. 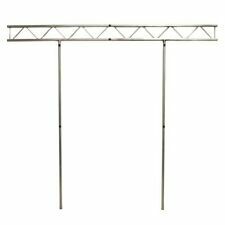 Aluminum I-Beam truss for the Pro Event Table and Pro Event Table II to hang lighting fixtures such as lightweight par cans, wash fixtures, effect lights or small moving heads. Includes hardware for mounting to the table and carry bag. What a fantastic idea to give your speaker stands a different look. Rack Cases. Load Capacity 27kg. Bubble Machines. Stand Accessories. Speed Adjustable. Price each. Direct Color Select. Disco Lighting. Rack Cases. DMX Lighting. Laser Lighting. Complete with Fixing Bolts and Wing Nuts. Single Overhead Lighting Bar is 2600mm In Length. Height Adjustable Lighting Bar from 2110mm to 2510mm. Load Capacity 66lbs/ 27kg. Upper shaft tubing 35mm. Demo Program Mode. Remote Distance up to 15m in open area. Includes RF remote. Speed Adjustable. Direct Color Select. This is to help prevent credit card fraud. ADJ - LED Speaker Tripod Stands. 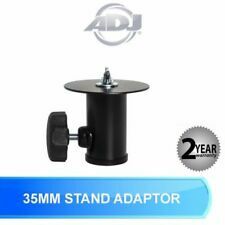 Complete your set with these new ADJ Stands. Authorised ADJ Dealers. • 22 Dynamic Modes. • Load Capacity 66lbs/ 27kg. • Demo Program Mode. • Includes RF remote. • Speed Adjustable. M20 threaded screw at one end to screw into speakers (standard 35mm fitting at other end). Black powder coat finish. Height: 820mm - 1250mm. Colour: Black. Professional lighting stand complete with TBar. Max vertical centric load: 30kg. Max height: 3 m. Min height: 1.48 m. T-Bar width: 1.20 m / 28 mm pole. The LTS Color lighting stand has been constructed from super-sturdy steel while the tripod legs have been made out of ultra-robust opaque polycarbonate plastic and contain multiple multi-coloured LEDs which work to illuminate the area around your stand. The ADJ LTS-300 is a robust tripod lighting stand which includes the T-Bar and fixings to help mount your lighting effects easily and safely. Rack Cases. DMX Lighting. Disco Lighting. Laser Lighting. The Color Stand LED is part of ADJ’s continuing pursuit for creating high quality affordable lighting. It features 22 dynamic modes with adjustable speed and 20 static colours (including 6 direct access color buttons white) with adjustable brightness to choose from. The LTS Color is a lighting T-Bar stand with LED lighting built into the tripod legs. The stand is made of sturdy steel, while the legs are constructed from robust opaque polycarbonate and contain a series of multi-color LEDs. Disco Lighting. 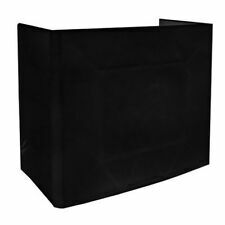 This fantastic carrying bag is designed specifically for our 4ft Disco Stand with Lighting Bar. Making transporting the stand easy and compact you can easily fit all parts to the stand within this bag. 4 x Duratruss/American DJ 50mm Truss/Barrel Clamp. Does not mark or scratch truss. Narrow design to fit in between truss lacing. Safe Loading 10kgs. Two universal Accu tripod, speaker stands carry bag. 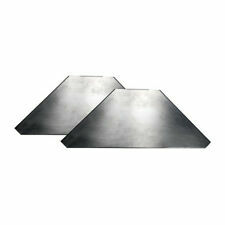 Heavy Duty Speaker Stands. With a Max Load of 36Kgs each. QTX 180.180, QTX 180.550 and ADJ LS50T. for DJ SPEAKER STAND. Microphone Cables. Speaker Cables. Rack Cases. Microphone Stands. Includes socket mounting bracket to attach to speaker. Heavy Duty Speaker Stands. Speaker Stands. Lighting Stands. PAIR of LIGHTING EFFECT ADAPTORS. • Stand adapter with M8 screw. 35mm Swivel Coupler. Fits 35mm tube for example speaker stand inner pole. Add to Favourites. 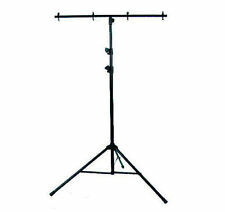 ADJ Accu-Stand LTS-6. 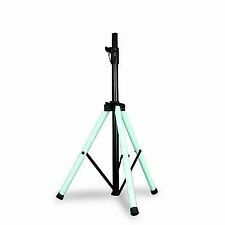 High Quality Tripod Lighting Stand. 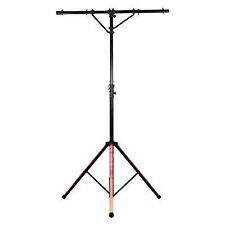 This low cost, Black tripod stand is ideal for hanging several types of par cans, pin spots and many other lighting fixtures. - Weight: 5 kg. 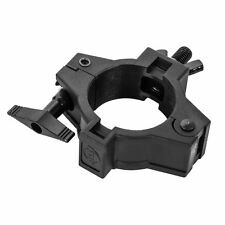 The ADJ Mini O Clamp is a smaller clamp that is designed to fit truss braces and will hold up to 9 Kg. 360° wrap around tube truss clamp. Laser Lighting. Disco Lighting. Designed to fit on horizontal and diagonal truss braces. The ADJ PRO-SHELF is an aluminium corner shelf for Pro Event Table. Sold in Pairs. The ADJ PRO-ETBS is black carrying bag accessory for the Pro Event Table II only. You can easily mount the shelves to your table and are also easily disassembled. Available in an elegant white or a dynamic black. The stretch fabric of the panels can be removed for easy cleaning or replaced depending on the desired colour combination. The enclosed carrying case allows easy storage and easy transportation. Such as DJ-MTS, DOTZ T PAR etc. 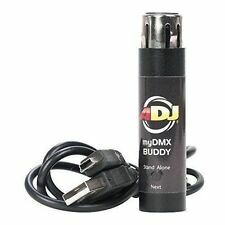 for LIGHTING DJ STAND. LAPTOP or NOTEBOOK STAND. Laptop stand for musicians and DJs. • Rubberized bearing area. Notebooks of every size can be put on top of this very strong stand. OSLIM 2 50mm Clamp. 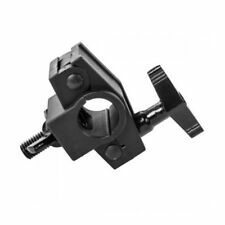 Clamp for trussing or lighting stand. The ADJ O Slim 2 Clamp is designed to fit in-between the in.Vin. This low cost, Black tripod stand is ideal for hanging several types of par cans or pin spots. - max load: 25kg.